Attention all cash-strapped internet fans and cheapskate dates! This Friday’s Ambient Intimacy event with the Beta Society is now buy-one-get-one-free! You can buy your first ticket right now (and we’ll let you bring your date for free the night of the show). This program will explore ways in which those intimate moments make their way into the public sphere. 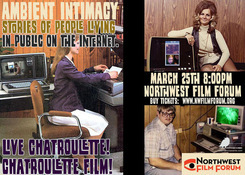 Ambient Intimacy presents a selection of the web’s most notoriously intimate moments; blogger moms, live interactive Facebook profile construction game, chat roulette on the big screen, and generally a show-and-tell unlike anything you’ve experienced in a theater before. Be a part of it! Hot Splice is on the move!